Morning Offering Prayer: My God, I offer You my prayers, works, joys and sufferings of this day in union with the holy sacrifice of the Mass throughout the world. 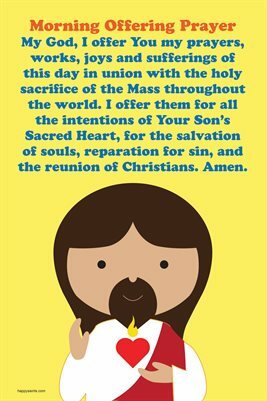 I offer them for all the intentions of Your Son’s Sacred Heart, for the salvation of souls, reparation for sin, and the reunion of Christians. Amen.